Since spring, some mysterious tiny bugs moved into my basement. I resisted in using the bug bumb. 1. Hoping that they’ll leave so I don’t have to kill them. 2. If I have to kill them, I don’t want to poison people by come in contact with the poison that’ll be everywhere in the room. Then I heard about CedarCide, 100% natural, non-toxic, people/pet safe, and made in Taxes, USA. Out of desperation (since the bugs didn’t hear my plead for them to leave), I bought a Best Yet 32 oz spray bottle to try. I started by cleaning the shelfs and carpet, then sprayed along the base of the wall. It didn’t work so well. Before I gave up, I sprayed the ceiling (a wood encased compartment for recessed lighting). That did the trick. The effect was immediate. No more feeling that some things are crawling up my legs to hide in the seams of my cloth and ready to bite. According to CedarCide, Best Yet kills bed bugs and their eggs. They also say that it is safe on pets and human skin as a bug repellent, and since it is oil based, it won’t be sweat off easily. There is also a gallon size available for refills or bigger jobs but so far I’ve only used up 1/4 of the bottle for a 200 sf room. Although the scent is not too strong but if you spray a large amount at once, I suggest you leave the area closed for a day or over night. I also covered electronics with newspaper, just in case the droplet go into the machines, but I’m just being paranoid. 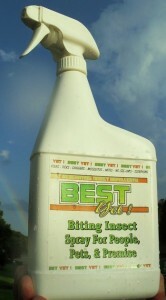 So, thumbs up for CedarCide Best Yet Bug Spray! This entry was posted in I Found This, Made in USA and tagged best yet, bug spray, cedarcide, insect repellent, made in USA, non-toxic by n2n. Bookmark the permalink.